The Ethiopian Heritage Fund (formerly the Committee for the Preservation and Promotion of Ethiopian Heritage (CPPEH)), was established and incorporated as a British charity in 2005 (n°1110969). Its first project was to finance the publication of Ethiopian Church Treasures and Faith, a book aimed at supporting the Ethiopian Orthodox Tewahido Church (EOTC) in its efforts to preserve, conserve and promote its artistic heritage. Since then it has widened its remit, working together with the EOTC, the Ministry of Culture and Tourism, the Authority for Research & Conservation of Cultural Heritage (ARCCH) and the Regional bureaus of Culture in order to aid the conservation of artifacts and paintings and to provide advice and education on their maintenance. Its other stated aim is to raise awareness of these beautiful objects within Ethiopia and thereby increase international tourism to rural areas. The EHF is entirely financed by donations and by those involved giving their expertise to the projects. The executive and the trustees of the Ethiopian Heritage Fund are responsible for the selection and financing of projects undertaken. The activity of the EHF mainly concerns five fields: liturgical movable treasures, buildings, museums, restitution of historical and artistic treasures and publications. Perched in the rugged highlands on the Horn of Africa, Ethiopia retains a unique position as an ancient Christian civilization. The history of artistic production in Ethiopia spans over 2000 years. Artists and architects have produced a stunning array of religious artefact processional crosses, illuminated manuscripts, painted wooden icons and wall paintings. 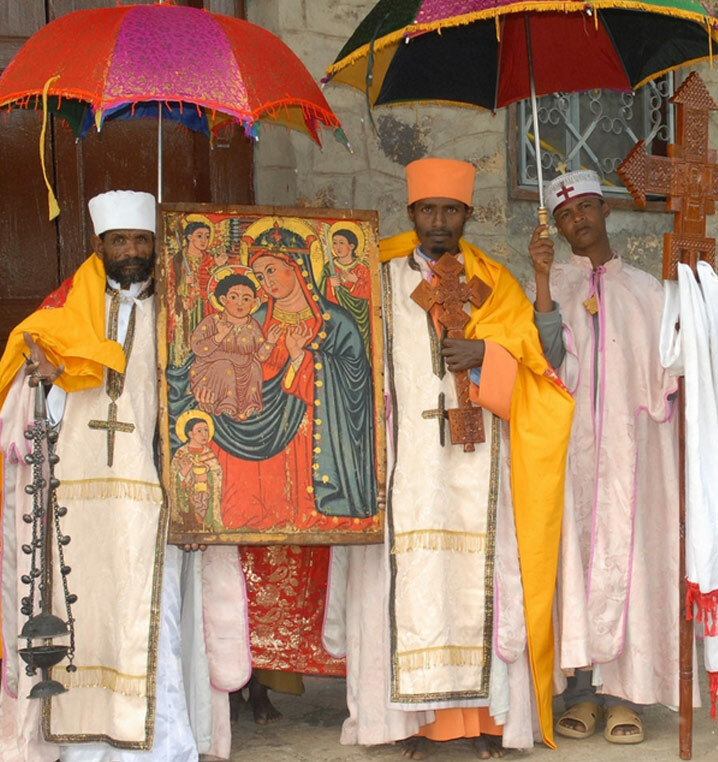 These holy treasures have a very special purpose in the Divine Worship service of the Ethiopian Orthodox Tewahido church. They are mainly cared for by monks and priests and stored in church treasuries often in remote districts. The dry climate of the mountains has been a great aid to maintaining the condition of the artefacts but inevitably many of them now need restoring in order to save them for future generations. Recent work of the charity is reported on the Projects page under the current projects button.